Seattle Independent Bookstore Day is the local home of the national Independent Bookstore Day, a one-day celebration on the last Saturday of April, hosted by independent booksellers for our readers and customers. Independent Bookstore Day is a one-day national party that takes place at indie bookstores across the country on the last Saturday in April. Every store is unique and independent and hosts its own party. And in addition to authors, live music, cupcakes, scavenger hunts, kids events, art tables, readings, contests, and other fun stuff, there are exclusive books and literary items that you can only get on that day. Not before. Not after. Not online. What Is Seattle Independent Bookstore Day? When Independent Bookstore Day went national in 2015 (after its founding in 2014 by booksellers in Northern California was a rousing success), Seattle's indie bookstores collaborated to showcase what we do best: build human connections through physical books, in a daylong celebration of the work we do and the readers and customers who make it possible. We offered many of the same events and exclusive items as our colleagues across the country, but we also introduced the Passport Challenge, encouraging readers to get their passports stamped at as many participating stores as possible on Bookstore Day. Those who get their passports stamped at every participating store that day are crowned Grand Champions, with a crown, a party, and best of all, a 25% discount at all participating stores for the following year. We admit we have been stunned by the response: in our first year, we weren't sure if anyone would complete the full Passport Challenge, but we crowned 42 Grand Champions. In 2017, our third year, the number of Grand Champions, all of whom visited 19 stores from Poulsbo to Kirkland to Queen Anne to Georgetown in a single day, exploded to 320, and in 2018 our total number of Champions increased yet again, to nearly 500. We're hoping for even more in 2019! 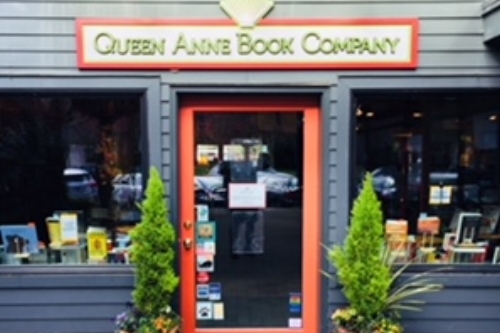 Independent bookstores in the Pacific Northwest aren’t just brick and mortar storefronts. We’re part of a thriving literary scene made up of writers, readers, librarians, and publishers (which was declared by UNESCO in 2017 an official "City of Literature"). We’re local literary destinations for our communities and staffed by passionate, well-read booksellers. We’re entire universes of ideas that contain the possibility of real serendipity. We’re lively performance spaces and quiet places where “just that right book” can be discovered. Bookstores are living, breathing organisms that continue to grow and develop each year. In a world of tweets, algorithms, and digital downloads customers find it reassuring to walk into a bookstore, smell the books, talk with a bookseller, and hold the books in their hands. This won’t change. And we’re here to stay. How Does the Passport Challenge Work? Seattle Independent Bookstore Day takes place on the last Saturday in April of every year, and in 2019, that Saturday falls on April 27. Individual stores choose their own operating hours, which are shown below. Visit our Facebook page and follow us on Instagram and Twitter. Use #SEABookstoreDay if you want to add to the conversation. 6. Eagle Harbor Book Co.